The creditor filed that to protect himself. When you file bankruptcy, the court imposes something called the “automatic stay,” automatically, which stays (stops) any creditor actions against you. It normally stops garnishment, foreclosure, even those pesky phone calls. Now if a creditor has already filed a lawsuit in state court, that lawsuit cannot proceed. It is frozen in place unless the creditor files a motion for relief from the automatic stay in the bankruptcy court. He can do nothing in state court until or unless the federal bankruptcy court grants that motion. Sometimes the creditor will file that “Notice of Bankruptcy Stay” to explain to the state court why he is doing nothing in the case. The creditor doesn’t want to be accused of inaction, or even worse, of neglecting a case, so he will file that notice to explain why nothing is happening. Usually, you get your bankruptcy discharge, and then the creditor can dismiss the state court action on their own, or if they simply do nothing for long enough, the state court will dismiss the suit. If your bankruptcy case is thrown out for some reason, the creditor will notify the state court of the bankruptcy dismissal, and they can proceed with their state court litigation. So the notice doesn’t really affect you; it just protects them. 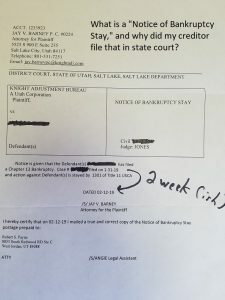 This entry was posted in Utah Bankruptcy on February 21, 2019 by robertspaynelaw. 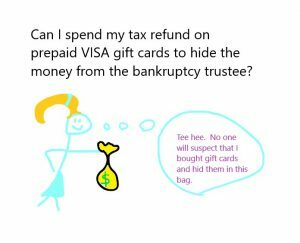 Can I spend my tax refund on prepaid VISA gift cards to hide the money from the bankruptcy trustee? This time of year I have a large number of potential clients who are waiting on their tax refunds. If they file bankruptcy before they receive and spend the refund, then they will lose that refund money to the bankruptcy trustee. If they delay filing the bankruptcy for a few weeks, they can receive the refund and spend it on exempt (protected items). 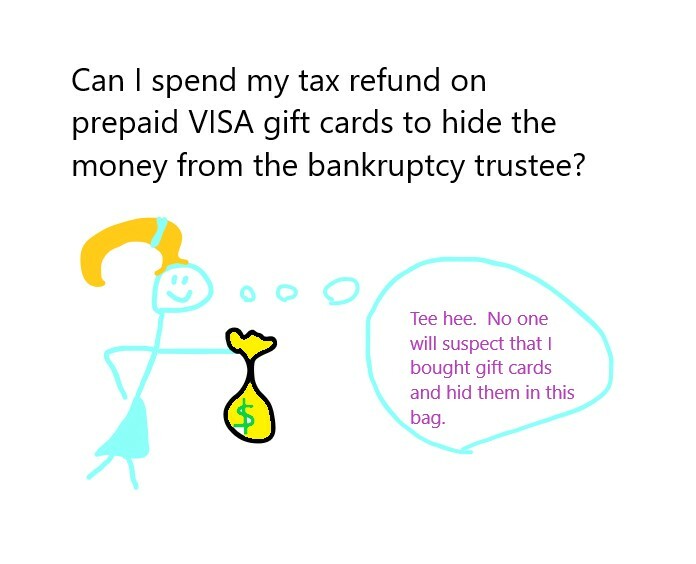 I’ve written enough blog articles on how to spend you tax refund before bankruptcy, so I won’t go over that again. However, I need to warn you: Do not try to trick the trustee. The bankruptcy trustee has handled tens of thousands of bankruptcy cases. There is nothing you can think of that he/she hasn’t already seen. I had a client ask me if they could spend their refund on prepaid gift cards. The answer is a resounding, “No!” Those gift cards are the same as cash, and if you try to squirrel away cash before filing bankruptcy, that is fraud. When the bk trustee discovers it, your case will be thrown out, your discharge revoked, and you’ll get sued. Just play by the rules and you’ll be fine. 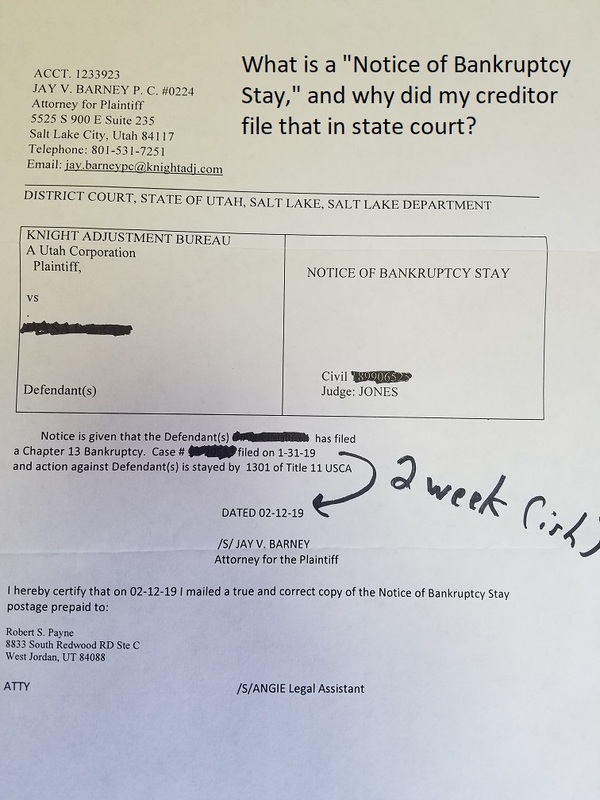 This entry was posted in Utah Bankruptcy on February 11, 2019 by robertspaynelaw.